We do not require language certificates for English language and these courses are completely taught in English. The First Faculty of Medicine has qualified to participate in programmes under Higher Education Act of 1965 (HEA) and the Federal Student Financial Assistance Programs (Title IV, HEA programs) in the USA. Charles University - First Faculty of Medicine participates in the Federal Family Education Loan Stafford Program (OPE ID Number G33004). to be allowed to apply. First Faculty of Medicine requires for admission completion of at least three Advanced (A) Level subjects. All Advanced (A) Level subjects must have grade C or better. Two of them must be Advanced (A) Level from subjects Biology or Chemistry or Physics. Third Advanced (A) Level can be any other (A) level subject. Two AS subjects are not deemed to be equivalent to one 'Advanced Level' subject. We require high level of Biology or Chemistry or Physics, we require two out of these three subjects. The required number of points is 36 to be able to apply. ALL APPLICANTS HAVE TO HAVE RESULTS FROM THEIR HIGH SCHOOL THAT WOULD ALLOW THEM TO APPLY TO THEIR LOCAL MEDICAL UNIVERSITY TO BE ABLE TO APPLY TO OUR FACULTY. Fill in electronic application form or contact one of our representatives to help you with electronic application form on time and send PDF application for entrance exam in Prague by e-mail to fsad@lf1.cuni.cz (or to the representatives e-mail if you don't do the entrance exam in Prague) and pay 640 CZK for application registration. Without payment the applicant won't be allowed to attend the entrance exam. Successfully pass the entrance exam. Each student can apply once per academic year to one of the study programs and can file one application for one study program. It is not possible to apply for the same study program in the Czech and English language. Students may start their application process prior to completing their secondary education. Application can be done directly to First Faculty of Medicine by filling in the online application form or by contacting one of our representatives, who will help with filling of electronic application. You have to pay 640 CZK for application registration. Without payment the applicant won't be allowed to attend the entrance exam. For the direct application go to https://is.cuni.cz/studium/eng/login.php?do=prihlaska and make sure to fill it in latest by 30th of April 2019. Should you wish to apply through one of the official representative please contact them for details. There is a total number of 150 places for General Medicine and 20 places for Dentistry course available to applicants for academic year 2019/2020. If you need any special arrangements in order to organize your travels to entrance examination please contact us individually. We start accepting application forms from 1. 1. 2019. Under Art. 4 (5) of the Admissions Procedure Code of Charles University, the faculty is to send to an applicant the invitation to an entrance examination through the University Electronic Information System not later than 30 days before the date of the examination. Should the faculty send an invitation for an alternative date of the entrance examination this period may be shortened accordingly. A password to log into the electronic information system is obtained by an applicant after the applicant has submitted the application to study. Students are offered a place at the Faculty based on their result in our entrance examination. ENTRANCE EXAM IS COMPULSORY FOR EVERYONE. It consists of written multiple-choice test from Biology, Chemistry and Physics and an interview for those who successfully pass the written part. From each subject (Biology, Chemistry, Physics) you can gain 100 points. Successful candidates must achieve at least 244 points out of 330. Naturally both test and interview are in English and supervised by the Faculty’s examiners. Both parts are taken the same day, so you should know immediately if you have reached the required number of points for admission. Sample questions are available. Without payment for application form you won't be allowed to attend the entrance exam. Calculators and periodic tables are not allowed. IF YOU WANT TO DO THE EXAM WITH REPRESENTATIVE PLEASE DO NOT SEND THE ELECTRONIC APPLICATION FORM TO OUR E-MAIL BUT TO REPRESENTATIVES E-MAIL! You have to bring for registration invitation letter from our faculty (you should receive it beforehand by e-mail) and passport or ID. There is also additional date for Prague’s examination on 28th of June 2019 which is designated for those who can not attend the regular date because of illness or some other serious reason. If you are not able to attend regular term please send us explanation why (for example medical report from doctor etc.). Though please note that there will be only limited time for you to make all the necessary arrangements (visa and accommodation application, etc.) should you attend this additional term, mainly due to short period of time between the examination and enrollment. Those mentioned reasons wouldn’t be accepted as legitimate reasons for postponing your enrollment or any of the study obligations. Therefore it is highly recommended to make it to the regular term, unless you have some serious reason not to. An invitation letter for the entrance exam will be send by an e-mail at the half of May. If the invitation letter is needed earlier, please let us know. An e-mail will be sent to every applicant who meets all the criteria. According to the Dean's provision n. 9/2018 can be recognized only exams and marked credits which student passed with mark Excellent (A) or Very good (B). Also the final results from particular exam can't be older than 8 years for General medicine and 7 years for Dentistry. Also previously recognized subjects on our Faculty are not recognized again. 1st Faculty of Medicine admits students only to the 1st year. We don't guarantee in which year will student finally study. If student will successfully pass the entrance exam and will accept the offer, s/he will be enrolled automatically to the 1st year of studies. Her/his results from previous university must be recognized by the heads of institutes, which are responsible for particular subjects on 1st Faculty of Medicine. Because of that student have to visit during the first two weeks of new academic year all professors asking for recognition (involve subjects from 2nd, 3rd year etc.). WE DON'T GUARANTEE IN WHICH YEAR WILL STUDENT START HIS/HER STUDY. To move to higher year means to have all compulsory subjects of higher year of OUR study plan recognized by our teachers. To these compulsory subjects also belong CZECH LANGUAGE and PHYSICAL EDUCATION. If the student will miss only one of compulsory subjects from our study plan s/he has to stay in a 1st year. Each student has to follow the admission procedure as regular applicant and succesfully pass the entrance exam. Dean also can reject the admission because of capacity of places in particular year. Student pays the same tuition fee as its set for regular student in particular academic year. Have all your documents ready even before entrance exam, for example criminal record or parental consent affidavit if they are required by the embassy so the process won't be restrained after your admission. The obligations ensuing from the Act on the Residence of Foreign Nationals for citizens of the EU, Iceland, Norway, Liechtenstein, or Switzerland is the "reporting requirement" in the event that the length of the intended stay in the Czech Republic is longer than 30 days. 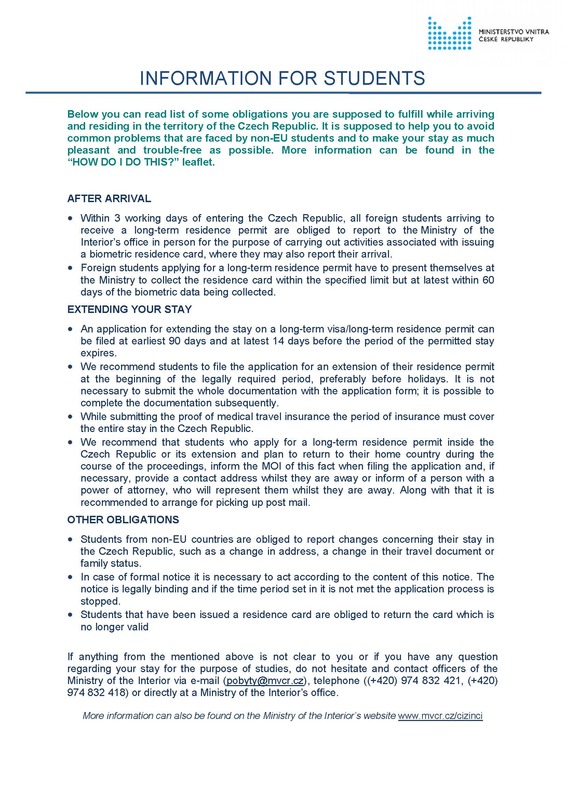 In this situation, within 30 days of entering the Czech Republic, an individual is required to report his/her presence to the appropriate Foreign Police Department that holds jurisdiction in the location of his/her stay in the Czech Republic. Without payment the applicant won't be allowed to attend the entrance exam. Tuition fee is same for EU and non-EU students. Tuition fee must be paid only in Czech crowns and must be paid in one installment. Faculty doesn't provide any scholarships for tuition fee. Faculty has right to set the fees for each commenced year of studies in accordance with Annex 6 of the University statute. This means that in the following years the sum of the fee can be adjusted according to the said Statute. lodging, meals, books, transportation, etc. Cost can significantly vary depending on spending habits. Please see the Living in Prague section for more. How to pay tuition fee? For admitted students are determined these PPT presentations. As for living, English will work perfectly for you, but in order to be able to communicate with the patients on the wards during the clinical rotations some basic skills in Czech will be necessary. During the first three years of medical studies the student will attend lessons and tutorials in Medical Czech. There are also plenty of opportunities to practice Czech in the city. Students can stay in the Residence Halls, we guarantee place for our 1st year students. Pictures of rooms could be find here. Our students usually stay at Komenskeho, Kajetanka and Hvezda. It is currently very popular to rent a flat. It is quite common to get an apartment in the centre, few minutes away from the campus at around 500 EUR per month if you share. can significantly vary depending on spending habits. Sample costs are introduced here. The Academic year is divided into two semesters, each followed by exam period. The winter semester starts at the end of September and lasts 15 weeks. It is interrupted by a 2-week Christmas vacation and followed by a 4-week examination period. The summer semester lasts 15 weeks and is followed by an examination period and summer vacation. Starting from the 2nd year, summer clerkships in clinical departments are included in the curriculum. Please feel free to contact us any time for further details regarding studies, accommodation, insurance, expenses, contacts to students… anything. There are several official representatives of our Medical Faculty around the globe. Gaborone Medical Centre – representative for Botswana and SADC (Southern African Development Community).